A group of six Downpatrick RGU members and supporters are planning to run the 28.2 mile Dublin marathon for young Hollie English. And they are doing it the hard way! Not as a relay team but each will run the full distance on 28 October in Dublin. Running in the Dublin Marathon for the Down Syndrome Association are Karen and Damien Curran, JR Lowden, Barry Gracey, Judith Curran and Joan Gracey. Hollie, their niece, suffers from Downs Syndrome and her birthday is coincidentally on the same day as the marathon. The team will be planning to give her a great birthday present by making a donation to their cause… the Downs Syndrome Association. 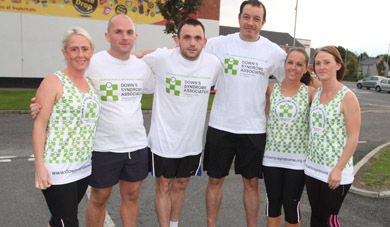 The team – Karen and Damien Curran, JR and Judith Lowden, with Barry and Joan Gracey – are now well into their training regime and have been jogging the roads around Downpatrick for several months already in preparation. JR Lowden said: ‘This is the first time we have taken on a marathon like this but we are all up for it. It is such a great cause. It is on Hollie’s birthday so it will give us all an extra incentive to cross the finishing line.